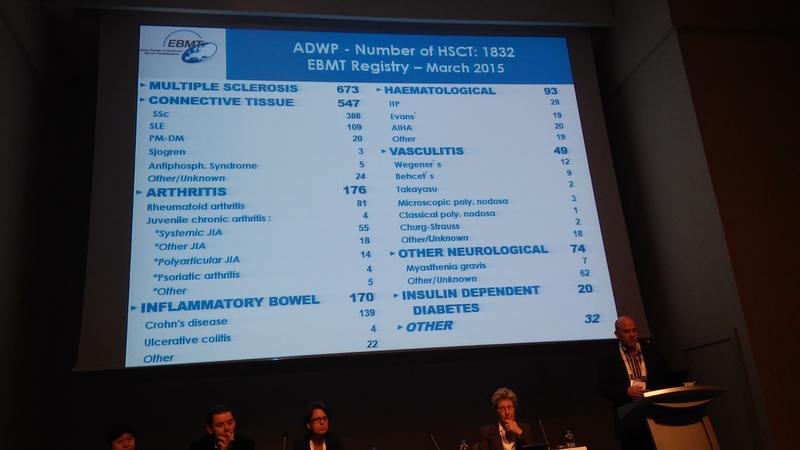 EBMT 2015 – News and progress in HSCT in autoimmune diseases | Emilian Snarski M.D. Ph.D.
Transplanting activity in Europe is stable. The center with most HSCT in MS & other diseases in last five years is Bone Marrow Transplantation Unit in Katowice (POLAND). Actually they as single center transplanted probably around 20% of all HSCT for autoimmune diseases in Europe last year. Congratulations for my colleagues there and wonderful professor Sławomira Kyrcz-Krzemień (showing the new patients’ flats) for their work and success with many Polish patients. So far they only accepted patients from Poland who can get this treatment when indicated paid by National Health Insurance. The foreign patients could possibly be accepted but they have to contact the hospital administration (the HSCT price will probably be in the 40 000 USD range – but this is not confirmed and once they start to accept foreign patients I will post some information on that). John Snowden showing the registred transplants in autoimmune diseases in Europe. Then search the disease you want in the title section (e.g. multiple sclerosis or other diseases). Russian study on kids with aggressive MS (age under 18) – EDSS over 6 at HSCT shows improvement of average 2,5 (maximum 5,5 EDSS improvement). Unfortunately, some relapse and some need immunosuppression after HSCT. Read more here. 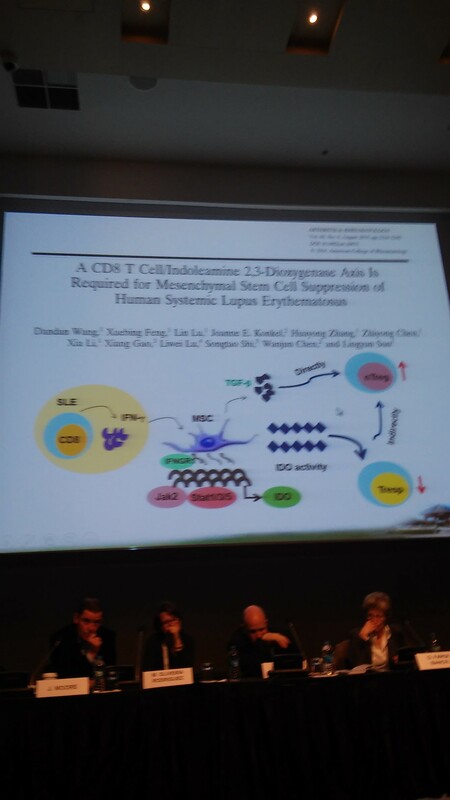 Maria Oliveira had presentation on HSCT in different autoimmune diseases in South America. You can read the abstract here. Important note – the BEAM group has been transplanted at the beginning of HSCT there and patients were high EDSS (thus higher mortality 3/21), the further HSCT with Cy+ATG protocol had 0% mortality (0/100). The results support HSCT when inflammation is present in the brain. Also the new study for patients with diabetes type 1 started recruitment in Brasil, US and France – with good results. As we wait for official publication of the fertility study done together with help of Forum members the abstract has been presented as poster on the EBMT conference 2015. The most important results: 73% of women had children prior to HSCT. All women in the study who were younger than 32 years of age had return of menstruation few months after HSCT. Menstruation could return in women up to 41 years of age (35% of chance). 15% women wanted to have children post HSCT – half of them had children prior to HSCT. As we know that the roughly 4% of women have children after HSCT for autoimmune diseases (other study by EBMT) and now we know that only 15% wanted children after HSCT – this might mean that pregnancy chances after this type of HSCT might hypothetically be somewhere between 25% and 50% in women who have pregnancy wish after HSCT – this is much more optimistic once we know how many women had children prior to HSCT. The limitation of the study was small number of patients – so we need bigger studies and more data. This study might be followed soon by multicenter EBMT wide study that will be directed to many more patients and might give even more accurate data. The work was done by Martyna Maciejewska and me with very active support of Forum members. I hope we can run more studies in the future. After the infusion the cells are destroyed and released cytokines influence the function of the immune system. I am intrigued by this results but bit sceptical – however ready to embrace if they are repeated by other transplant teams. You can read abstract here. If these results are repeated this will mean that we can finally use cord blood for some common medical conditions.